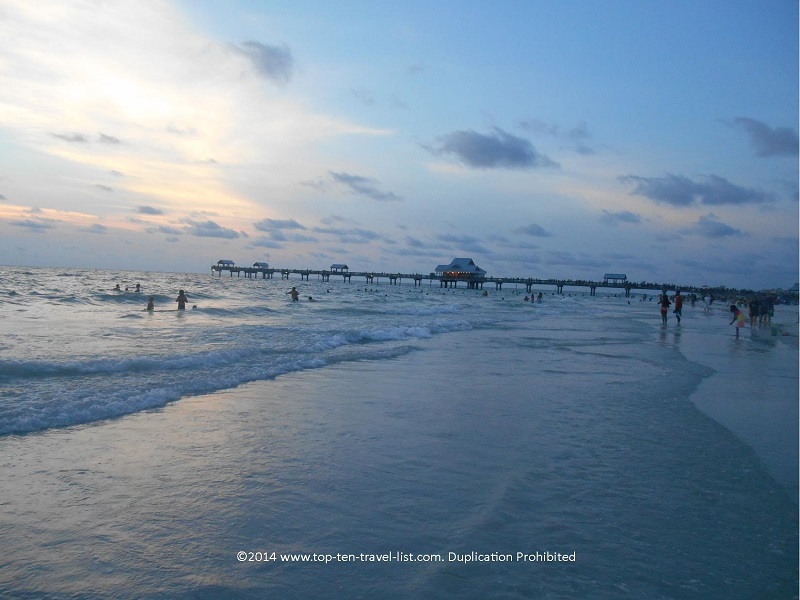 10 Free Things to do on Florida's Gulf Coast - Top Ten Travel Blog | Our experiences traveling throughout the US. Aside from pricey theme parks and tourist attractions, Florida also offers many wonderful free natural areas. Those on a budget will find that there are plenty of entertaining sights to see without spending a dime. When visiting Florida, it’s hard to imagine that anything is free, based on the absurd prices you pay for theme parks, resorts, and other tourists traps. However, if you venture out a bit, you will find that every area of the state offers its’ own unique pockets of free natural wonders. The Gulf Coast, in particular, is home to some of the state’s most gorgeous beaches and parks. Take a look below at 10 free things to do on Florida’s Gulf Coast. Incorporate a few of the suggestions into your itinerary for a budget friendly vacation. 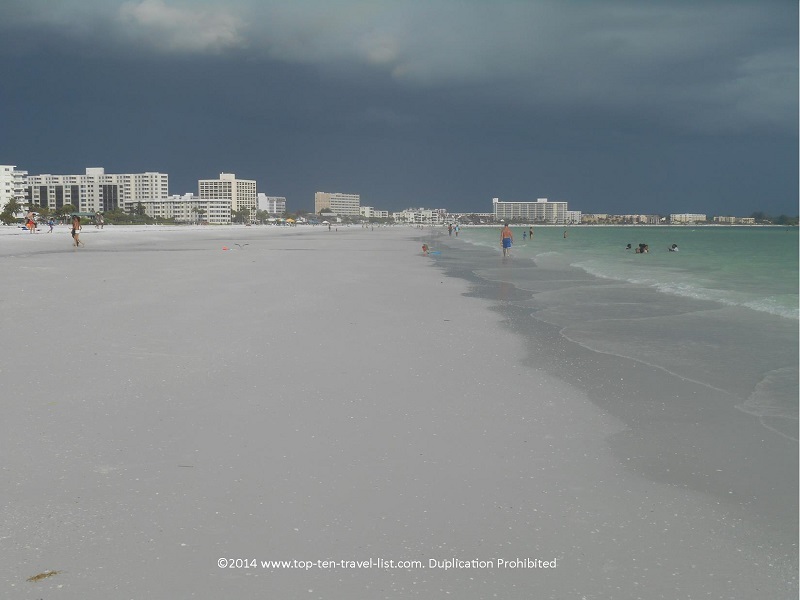 Clearwater Beach – Clearwater is famous for it’s smooth, white sand that almost feels as if you are walking on flour. There are no broken up shells anywhere, so everywhere you step is just pure soft sand. Whether you feel like taking a long morning stroll, sunbathing, reading a book, or playing a game of volleyball, the setting is right for a full day’s worth of fun. There is one downside to enjoying the smooth, white sand, and that is, sharing the space with crowds and crowds of people! Visit on a weekday morning to avoid some of the congestion. Pier 60 at Clearwater Beach. 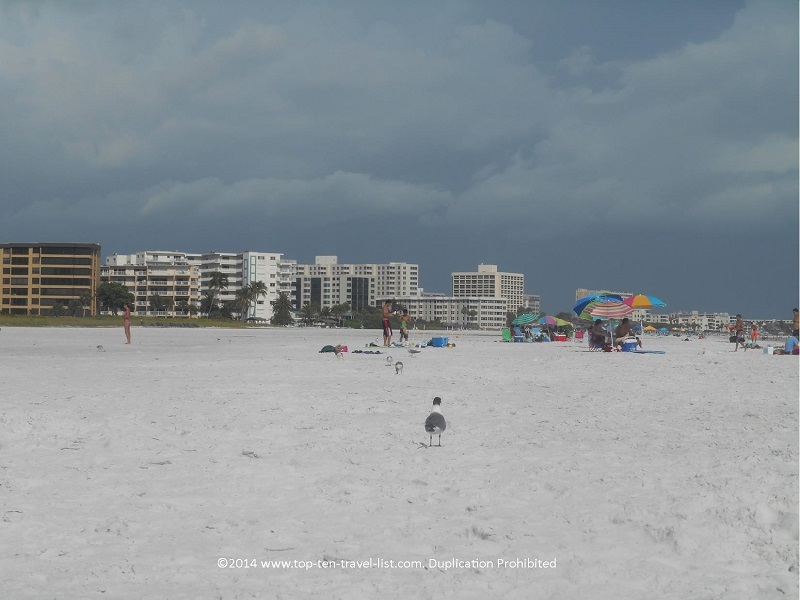 The flour like consistency of the sand at Clearwater Beach. 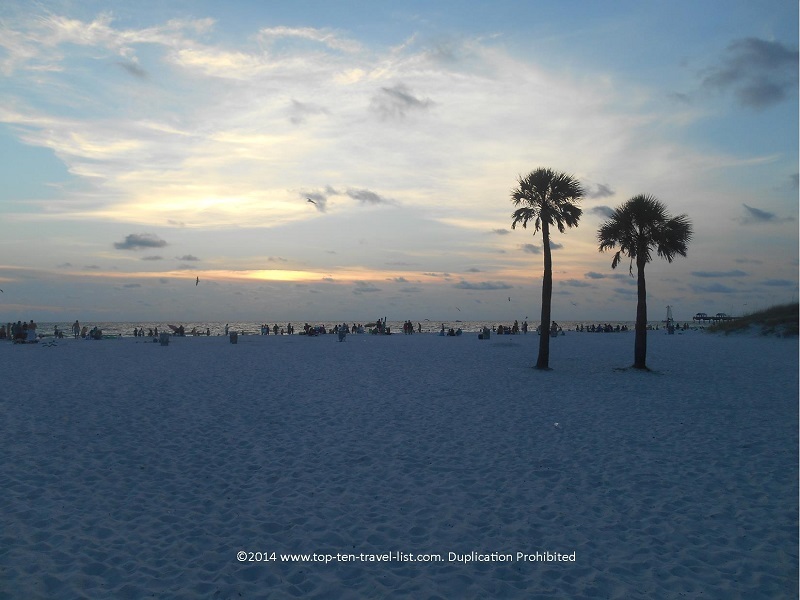 A beautiful sunset at Clearwater Beach. 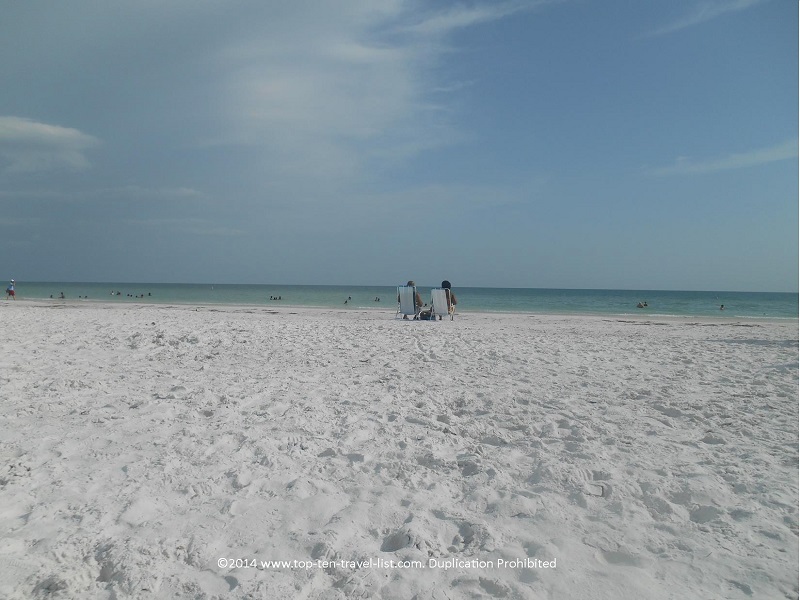 Siesta Key – Siesta Key is another beach featuring some of the smoothest sand you will ever feel. The 99% pure quartz sand is magnificently soft and absolutely cool to the touch. Depending on the time of the year you plan your visit (winter is typically the busy season), you will experience hoards of crowds or a surprisingly peaceful setting. Aside from sunbathing and swimming in the warm waters of the Gulf, Siesta offers a little outdoor recreation in the form of volleyball and tennis courts. 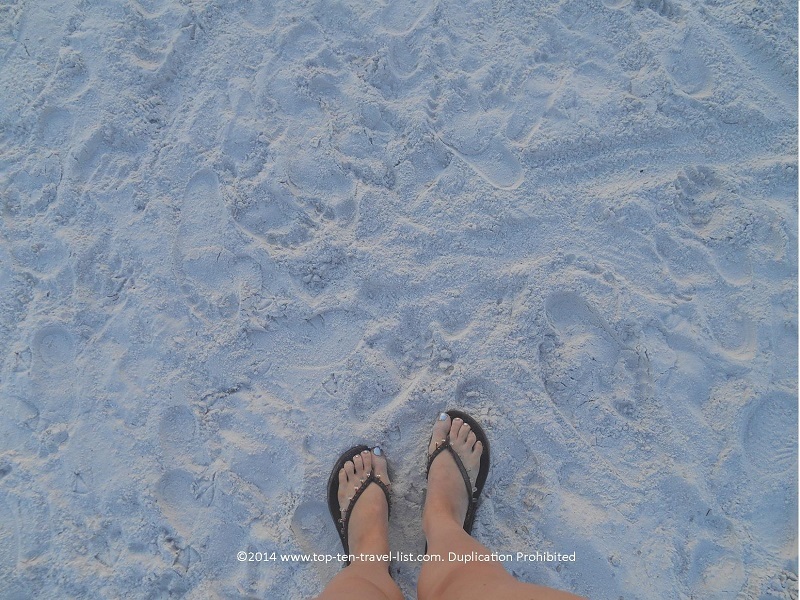 A look at the 99% pure quartz sand found at Siesta Key. 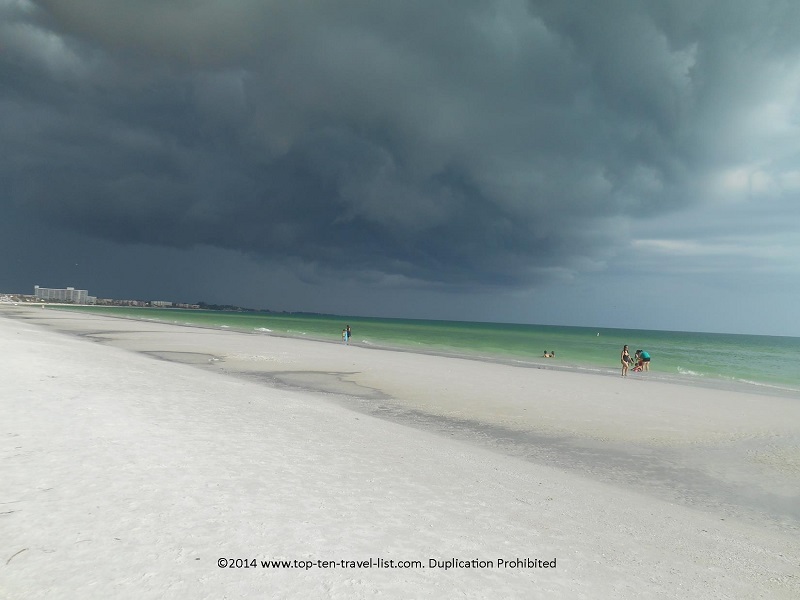 A summer storm making its’ way through the beach.